After the break I'm sat in a session looking at power bases in an organisation. Strangely, I was researching this very thing this morning on the train as I'm keen to map out the social network that exists at an informal level in my new organisation. This session is in the Learning Theatre, at the edge of the exhibition hall and next to the kitchens, which unfortunately meant that the background noise was considerable. The bench arrangement meant that, for us bloggers, there was no way to lean back in a chair in order to perch ones tablet on ones lap, and I suspect my back will suffer afterwards. Lucky for me there is an exhibitor offering chair based massages, and as this is something I often cry out for at conferences I will be visiting this stand. Any other exhibitors who wish to give me a massage will benefit from a similar visit to their stand. This session is about the psychological contract. Jason wanted to cover how organisations focus on power and the ability to influence. 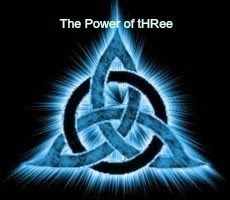 He says there are multiple sources of power, and some of these come from ones social network and things that are intrinsic to you like skills and knowledge, as opposed to those that are conferred upon you by the organisation like structure, role and authority etc. Often organisations only focus on structurally endorsed power, and not on socially endorsed. It's this latter bit I'm interested in. Jason recommended that organisations harness this social power to drive engagement and alignment within an organisation. So who are these socially powerful people in an organisation? You can ask people who they trust. Who they collaborate with. Whose expertise they recognise. Who they feel is influential. And some other questions too. Answering these identifies who the socially powerful people are and builds a different view of the organisational chart. The identified people will be both a great source of information and a great disseminator of information, and therefore are of high value to any executive team. This is the kind of thing I want to do in my new organisation, but I don't know whether it's the kind of thing a new senior leader can do without arousing immediate suspicion. What Jason says you'll find is that these people are the key opinion leaders, but making up only 3%, of the organisation. He also made the point that there is a strong correlation between high levels of EQi and social power, which I would agree with. I definitely need to do this and will researching the available software for this. Jason made the link at the end to changing leadership development to encourage the building of socially endorsed power, and this is also something I need to work on. 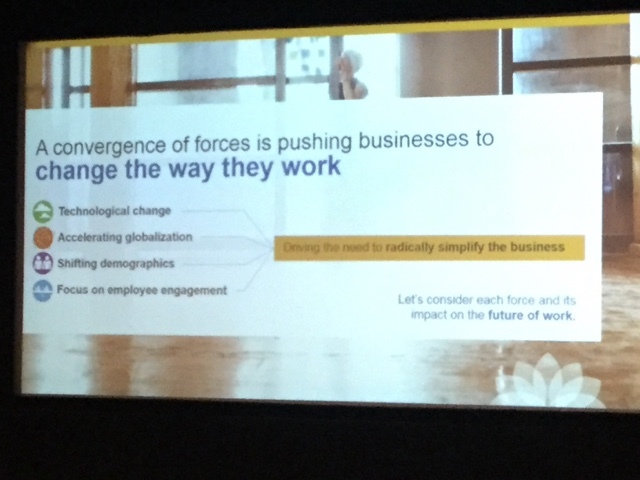 A quick dash to my next session sees me listening to Mike Theaker from SAP Successfactors looking at the changing world of work and how HR needs to respond. Mike looked at each one of these four factors in turn. Firstly technology. Mike covered a lot of statistics that have been quoted elsewhere and in other sessions at this event, so this one was a given. As was globalisation. And as was shifting demographics. Strangely most of the quoted statistics were about the US, which I guess highlights the globalised world but in a UK conference it would be helpful to see UK based statistics surely? And then the fourth one on engagement wasn't particularly new either. 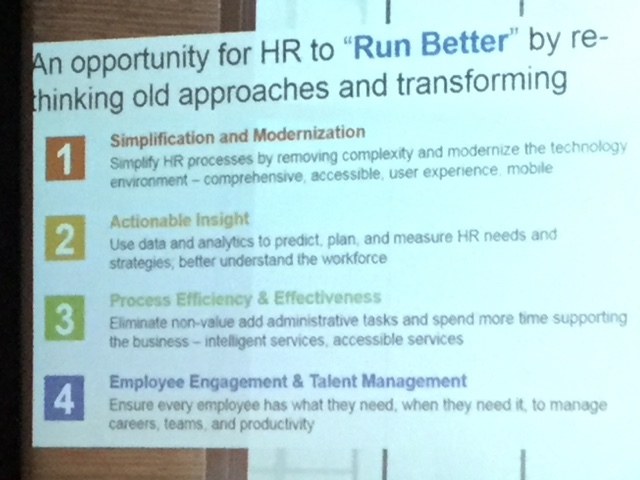 I think I came to this session wanting to hear what HR needed to do and could do to exploit these forces. Instead, Mike spent 20 minutes explaining what the forces were and whilst his talk was accurate and informative, it didn't give me the ideas for action I wanted during this time. Simplifying and modernising our technology is about "being more retail" as Capita mentioned earlier today in giving our workforce the technology to make choices and manage their employment experience in a way we already do for customer. Actionable insight is about embedding analytics into every process and understanding how we can improve and predict performance. Process efficiency is about devolving basic transactional activities to the line using the technology that's available. And finally engagement is about personalising the approach and having an individual approach to engagement and talent management. At this point even though I'm due in another session, I feel the need to speak, and also eat, as I'm a bit fatigued by workshop sessions right now. Back soon.